Satu’li Canteen is a counter-service restaurant in Animal Kingdom’s recently opened land, Pandora – World of Avatar. The restaurant offers American food but is more health conscious than the typical fast food grub. Satu’li Canteen does take part in the Disney Dining Plan (1 counter-service credit) but doesn’t accept any other discounts currently. We recently had dinner at this restaurant and this review will cover that experience. I know nothing about the movie Avatar. I saw the film once when it came out 8 years ago and wasn’t fond of it then. Even with the film not leaving an imprint on me, the theme park land does an incredible job telling a story that extends all the way to the restaurant, Satu’li Canteen. 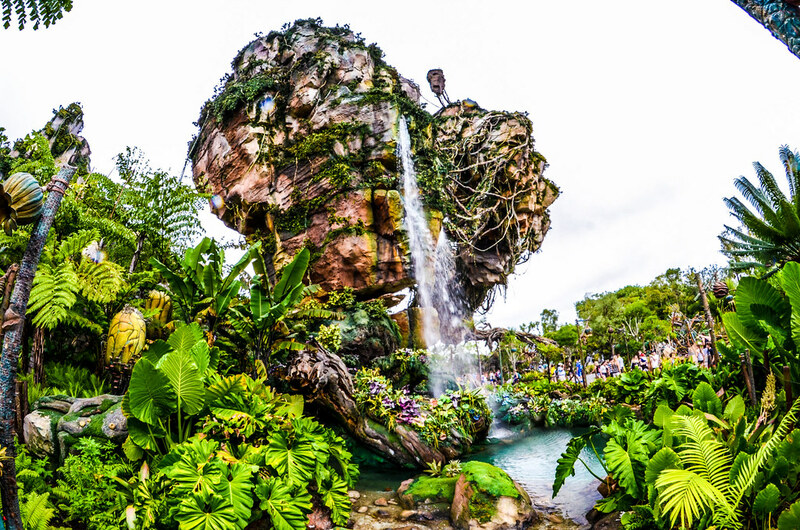 Without a doubt the land will be known for its beauty but there is man-made devastation in a portion of Pandora that doesn’t seem to fit in. This is the story that (I assume) the movie started to tell and the land continues to tell. Satu’li Canteen is inside of military mess hall that was used when humans were trying to take over(?) Pandora. All of this is fairly obvious just based on the surroundings. This makes the restaurant less beautiful than the rest of the land but it does fit in with the theme. That’s not to say the restaurant is ugly. 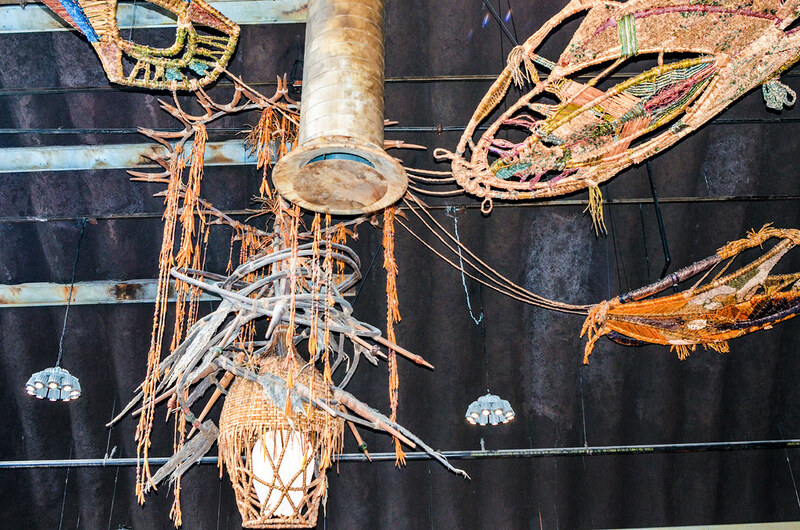 There is some artwork hanging from the ceiling that fits in with the rest of Pandora. I liked the woodwork throughout the restaurant, which felt somewhat organic. Still, with the beauty of the land, it’s a somewhat odd choice to make the restaurant so generic. With beautiful sights around every corner in Pandora, the atmosphere in Satu’li Canteen is a bit of a letdown. This is still a perfectly pleasant place to sit down and have a meal or drink though. While the atmosphere is slightly underwhelming, the food certainly isn’t. Satu’li Canteen continues to fit the Pandora theme by having a very natural and healthy menu. 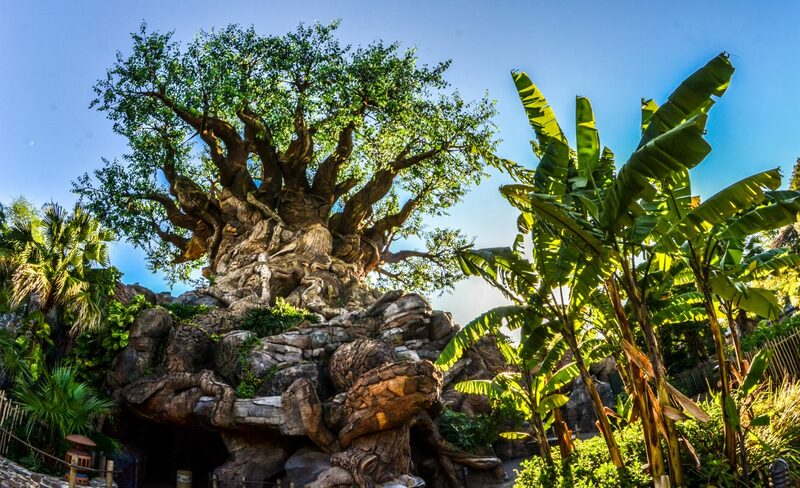 Animal Kingdom has always promoted conservation and a slightly different lifestyle than a typical theme park and the food here certainly endorses that. But, if I lost you at the phrase “natural and healthy menu” then come back because the food is truly delicious. Satu’li Canteen’s main entrée are bowls full of ingredients guests choose. The first ingredient is the protein in the bowl and your choices are chicken, beef, fish or tofu. The next decision to make is the base of the bowl and the choices are quinoa & vegetable salad, red & sweet potato hash, whole grain & rice, or romaine & kale salad. 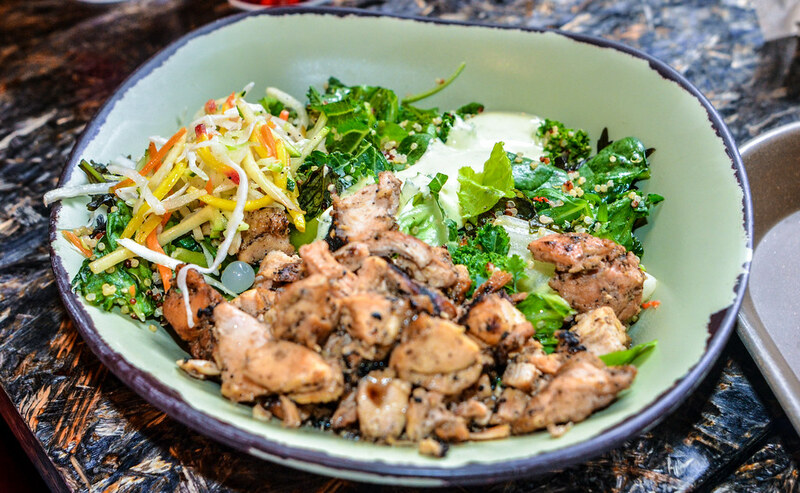 The last choice is the sauce on the bowl with either a chimichurri, black bean vinaigrette, or creamy herb dressing. Melissa went with chicken, quinoa & kale and the creamy herb dressing. The chicken was juicy and had a nice wood-grilled flavor to it. While it would be easy for the kale to get soggy, it didn’t and was a base that we both enjoyed. The creamy herb dressing was really solid and added great flavor to the dish. The vegetable slaw and boba balls you see on the left side of this photo comes with every bowl. Melissa wasn’t a huge fan of this but I enjoyed it. 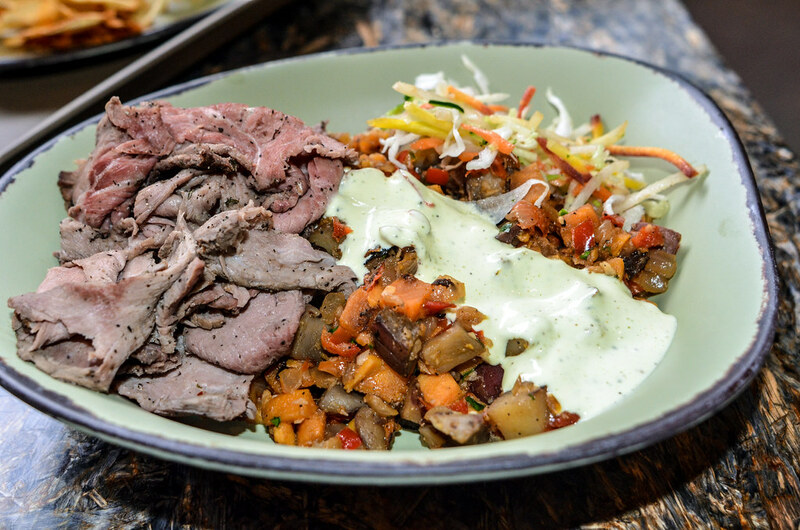 I went with beef, potato hash and the creamy herb dressing. Sweet potatoes are not my thing but I loved them in here. There was a wonderful blend of sweet and savory in this dish. The beef was the big winner here. The meat was tender, juicy and had strong flavor that I didn’t know was allowed at a counter-service restaurant. While Melissa preferred her dish to mine, this was my favorite counter-service item I’ve ever tried. This is table-service restaurant quality both in flavor and creativity. There are plenty of great counter-service choices at Animal Kingdom but this is my new favorite. At $12.99, I think the value here is strong. We also tried the cheeseburger pods and thought they were decent but nothing more. I wouldn’t recommend them for adults (the bowls are a much better choice) but I do think kids would enjoy them. For dessert we ordered the Blueberry Cream Cheese Mousse. Not only was the dessert pretty, it was delicious. I don’t really enjoy cream cheese or mousse but really loved this dish. The blueberry flavor was great and mousse was rich and creamy. 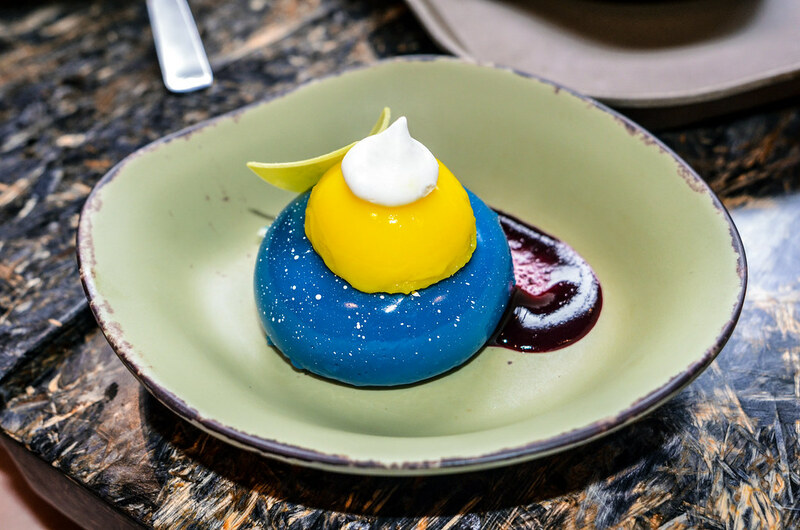 This is one of the better desserts in Animal Kingdom. 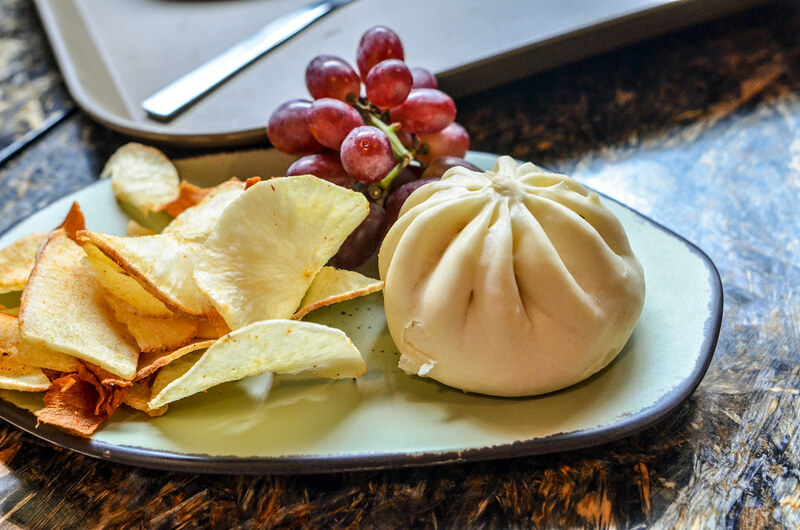 All in all, Satu’li Canteen is a wonderful addition to Animal Kingdom’s counter-service lineup. Without a doubt, this is a step in the right direction for those who want to eat both healthy food and quickly. I can’t think of a better option in all of Walt Disney World that combines both of those options. While the atmosphere could be better as it is throughout the rest of Pandora, Satu’li Canteen is still a nice place to cool off. I highly recommend Satu’li Canteen, no matter your food preferences. While the menu may seem a little more adventurous, I think the quality in food is as high as any other counter-service restaurant on property. Have you tried Satu’li Canteen? What are your thoughts or questions on the restaurant? Let us know in the comments! Thank you for reading Wandering in Disney, if you enjoy what you’re reading please subscribe to the blog and like our social media pages. You can do both of those things on the right side of this page. Have a great day! I was surprised by the lack of crowds in the actual restaurant. I recommend looking towards the back of the seating area and it should offer a break from the crowds.